In 2016, the General Assembly directed JLARC to study land application of biosolids and industrial residuals in Virginia. The mandate specifically called for staff to analyze the scientific research literature on potential effects on human health and the environment. Biosolids and industrial residuals are nutrient-rich materials left over at the end of sewage treatment or a manufacturing process. If they meet regulatory standards, these materials are can be applied to farm and forest land as agricultural fertilizers. Biosolids and industrial residuals contain pathogens and chemicals that may pose risks to human health and the environment. To minimize these risks, they are subject to federal and state regulations. 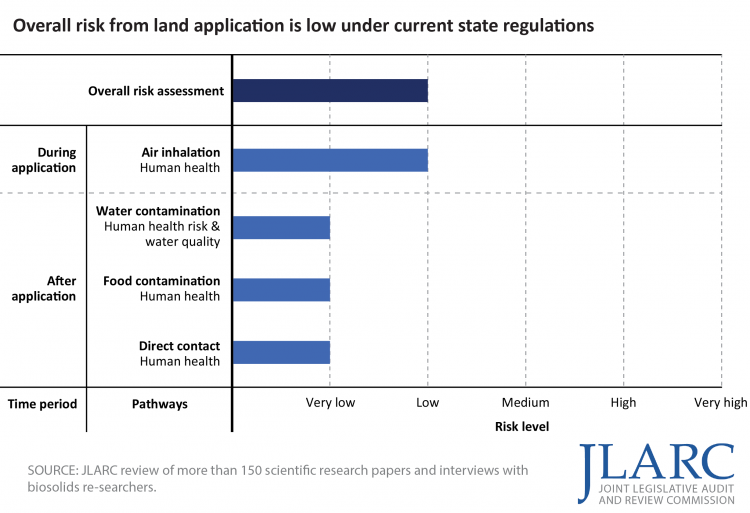 Land application of biosolids and industrial residuals poses some risk to human health and water quality, but the risk is low under current state regulations. This conclusion is based on the best available scientific evidence, but more research could reduce uncertainty. Even though risk is low, risk is sometimes slightly elevated during land application for nearby residents, who may inhale aerosolized contaminants. During land application, small particles of material become airborne. This material can be inhaled, potentially causing gastrointestinal illness or the common cold. The state’s regulatory requirements may not adequately mitigate this risk for nearby residents, but only under conditions that are optimal for exposure: when Class B biosolids (which contain pathogens) are applied and nearby residents are downwind and outside for an extended period during application. These conditions present greater risk at a small number of sites that receive far more land applications than other sites. The Departments of Environmental Quality and Agriculture and Consumer Services (DEQ and VDACS) each operate compliance programs that are generally effective. Both agencies’ processes ensure regulatory compliance. DEQ’s process to review and approve land application permit requests is reasonable and appropriately involves the public. VDACS’s process to initially certify products as safe and beneficial is also reasonable. DEQ’s process to inspect land application sites and correct violations is effective. Although the agency now inspects a lower percentage of land applications than in prior years, it still was able to inspect 31 percent of application sites in 2016. VDACS has an annual process for registering biosolids and industrial residuals, but its ongoing product verification process is not sufficient in all cases. VDACS does not verify, after its initial certification, that products continue to have acceptably low levels of potentially harmful chemicals. Appropriate funding for the Virginia Department of Health to (a) conduct a pilot epidemiological study of whether land application of biosolids causes human health problems and (b) test Virginia biosolids for pathogens. Assess whether regulations should be modified to reduce risks of infection for residents living near land application sites (a) when aerosolization of pathogens is more likely and (b) where applications are made more frequently. Require producers of industrial residuals to submit current chemical analyses as part of the annual registration process.